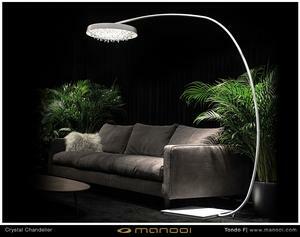 The final touch to illuminate your interior. Gliding shooting star through the sky. 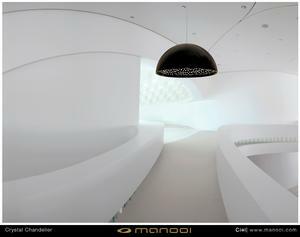 Dynamic, definite architectural elementent for reception or Lobby. 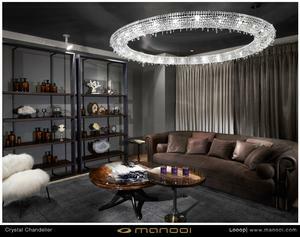 Manooi’s most famous collection of custom-made crystal chandeliers featuring our flagship product Ozero is called Personal Universe. 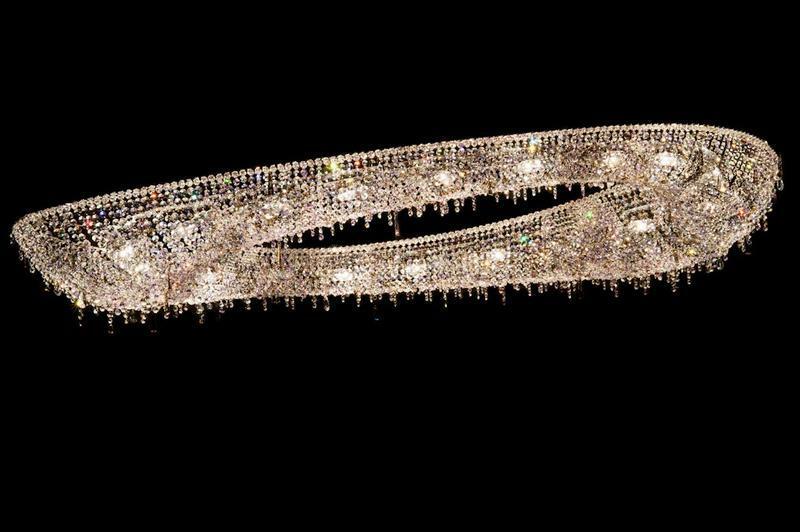 The contemporary and luxurious creations succeed in combining the eternal crystal material with the master knowledge of a skilled artisan. Glowing inner crystal hemisphere. Available sizes 60cm 100cm 180cm diameter. You can choose in colour black white or champagne gold. 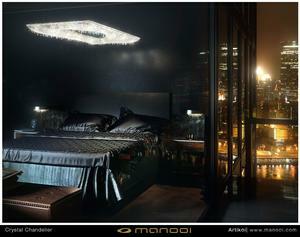 Your Personal Universe is a fully refined design form with sparkling Swarovski stars. You can choose in colour black, white or champagne gold. Inspired by the sparkling desert nightsky. 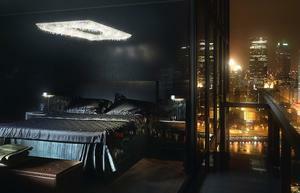 Your Personal Universe with sparkling Swarovski stars. Available sizes 60cm 100cm 180cm diameter. You can choose in colour black white or champagne gold. 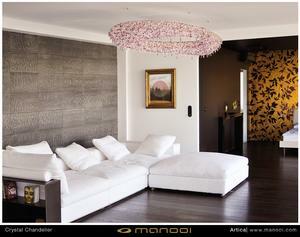 A suspended chandelier wich is specially applicable for the creation of attractive compositions. Three-dimensional waves in different sizes and colours according to your needs. 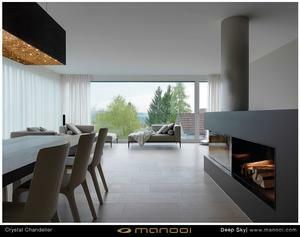 Whether you decide to choose from our catalogue or we custom create a peice working together with your ideas and needs in creating a one of kind chandelier, you will always be certain that our highly trained team consisting of a designer, architect and technician will create a unique work of art that you will always be proud of. Plus all of our work complies with only the highest standards. Any custom sizes that would meet your needs are also available. 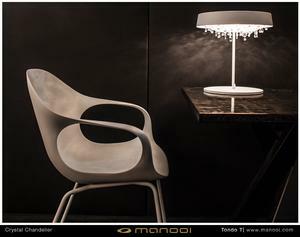 Slightly asymmetric, soft form made of highest quality materials. You can choose transparent or colored crystal combination. Available in different sizes and shapes. Artistic lines, perfect for forming a group. 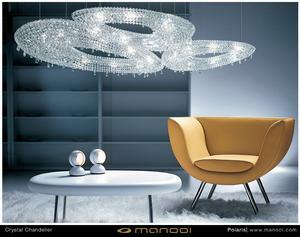 You can order Polaris in classic transparent or colored crystal combination. Available in standard sizes and also in custom sizes upon special request. Oeno is located in the South Pacific Ocean, an island of tranquility like our creation with its gentle curves and soft forms. 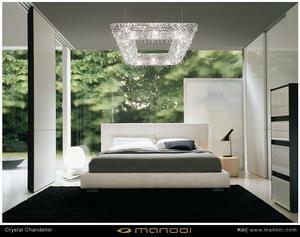 Your Oeno can be made of transparent or colored crystals. Available in 10 different sizes. Perfect simplicity. A majestic sign from the beginning of times. 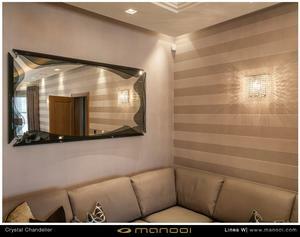 Personal and unique creation, due to our artisan technology. 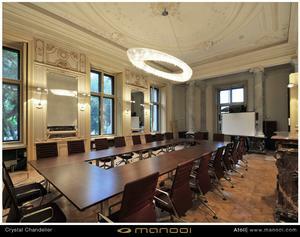 Its geometrical form fits ideally to various environments. 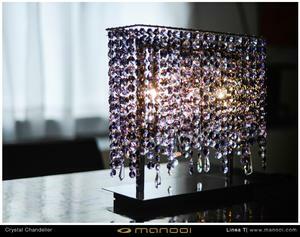 You can choose transparent or colored crystal combination in 9 standard sizes. 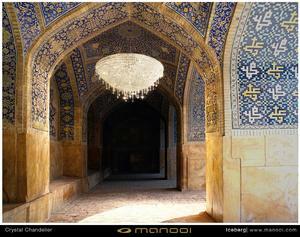 Classic natural form, a point of reference in space. 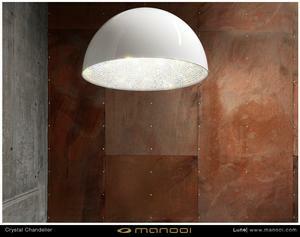 Wall mounted luminaire, available in 8 different sizes or custom tailored. You can choose transparent or colored crystal combination. 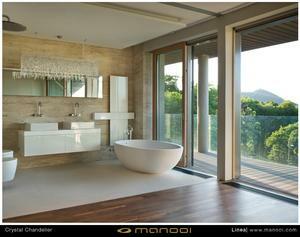 Classic natural form, made of highest quality materials. You can choose transparent or colored crystal combination. Available in different sizes and shapes. 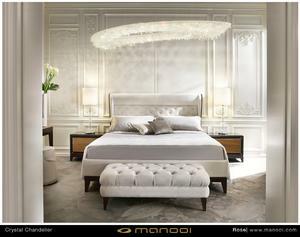 An elegant and unique classical shape made personally for each of our customers. 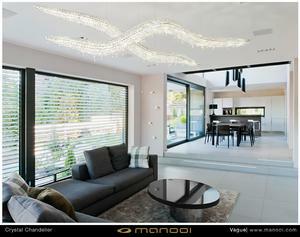 You can choose from transparent or a colored crystal combination in 8 standard sizes according to your needs. 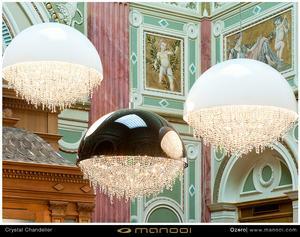 One of the technically most particular chandeliers created by the manufactory, with perfected quality and precision. You can choose transparent or colored crystal combination. Available in 32 different sizes and shapes. Or in customized version according to your needs. A personal and unique creation, due to our artisan technology. 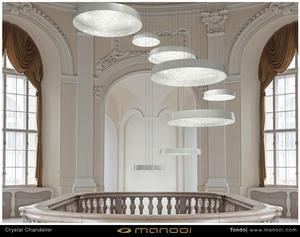 Its classical form fits ideally to various environments like staircases and atriums independently or in a group. 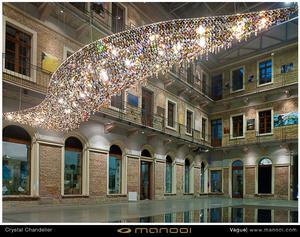 Available as ceiling, pendant or floor lamp, in transparent or colored crystal. 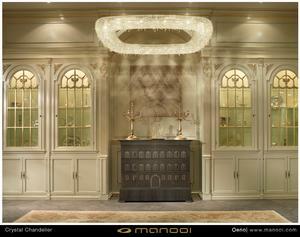 Each chandelier is unique and individual creation. 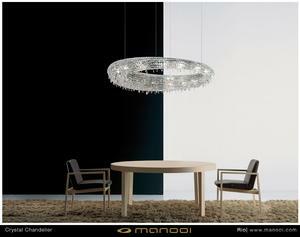 Perfect choice for lobby, living room or above diningtable. 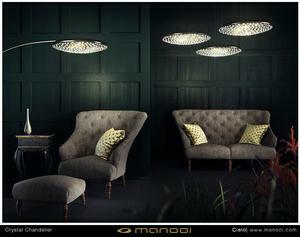 You can order Atoll as pendant or ceiling lamp. 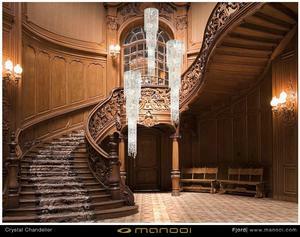 You can choose transparent or colored crystal combination in 9 standard sizes or according to your needs. Square frame with curved shape. You can choose transparent or colored crystal combination. Available in different sizes and shapes. 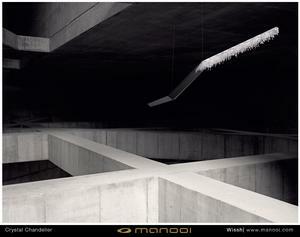 The first and one of the most successful of Manooi models. Made of highest quality materials. 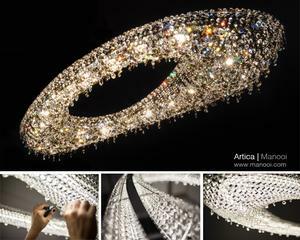 You can order Artica in classic transparent or colored crystal combination. Available in 7 standard sizes and also in custom sizes upon special request.